Manuka honey is indigenous to regions of New Zealand and Australia. It is derived from honeybees that feed on the nectar of Manuka bushes. 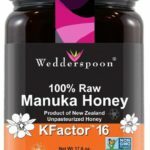 UMF or Unique Manuka Factor is a standardized worldwide rating that is used to denote the antimicrobial strength of Manuka honey-a UMF number above 10 is considered ideal for medicinal properties. You can treat a wide range of medical conditions with Manuka honey including acne, photo-damage caused by the sun’s UV rays, cuts, insect bites and even tumors. What I like about it: I love the smooth and creamy taste of Wedderspoon and the fact that it is manufactured in New Zealand. This honey is completely organic, non GMO and 100% unpasteurized. You can use it for your beauty needs, as a pre workout fuel and also for adding to post workout smoothies or protein shakes. The only downside to this honey is that it does not have a Non Peroxide (NPA) testing rating. The Active 16+ could be its UMF rating but it is not separately mentioned on the bottle label. What I like about it: I love the fact that this honey mentions its MGO value. MGO stands for methylglyoxal which is like the UMF rating. 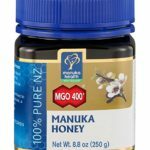 Methylglyoxal is the key component of Manuka honey that imparts it its medicinal properties. The honey is also made available direct from the hives obtained from remote regions of New Zealand and brought to you 100% natural, raw and pure. On the downside, it is a bit expensive and does not mention UMF value. What I like about it: It is a certified kosher honey. People have used it to destroy MRSA or staph infections and even avoid eye surgery. It is also thick and non-runny unlike other honey brands. Slather it up on your acne everyday for 2 weeks and see how your skin glows! On downside, the taste of this honey can take a bit of getting used to. 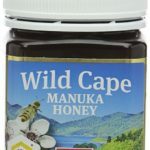 What I like about it: Wild Cape Company is a member of the UMFHA or the UMF Honey Association and has certified this manuka honey to have a UMF rating of 15+. The honey comes to us organically packaged from the eastern most region of New Zealand. It has anti-fungal, anti-tumor, anti-microbial and anti-inflammatory properties and can cure diseases like staph infections, acne, acid reflux, wounds, ulcers, sinusitis etc. It is 100% non GMO. What I like about it: Steens is known for 100% untouched, raw, and pure products. Their filtering process ensures that all B vitamins remain intact. The best part is that it is certified by both MGO and UMF ratings. The company also responds quickly to queries. 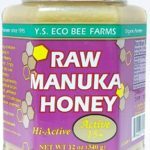 These are all great brands of manuka honey that we recommend. Try them for treating acne or with a face mask!